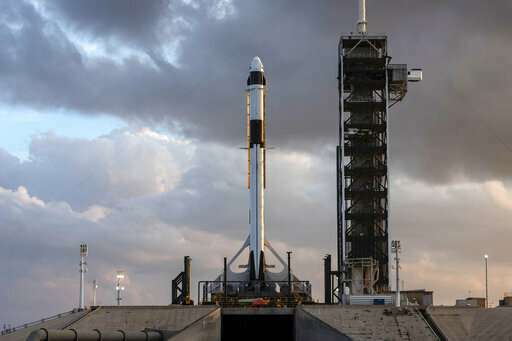 The six-day test flight will be real in every regard, beginning with a Florida liftoff Saturday and a docking the next day with the International Space Station. But the Dragon capsule won't carry humans, rather a test dummy in the same white SpaceX spacesuit that astronauts will wear. NASA doesn't expect this crucial shakedown cruise to go perfectly. But the lessons learned should improve safety when two NASA astronauts strap into a Dragon as early as July. "Giant leaps are made by a series of consistent smaller steps. This one will be a big step!" retired astronaut Scott Kelly, NASA's former one-year space station resident, tweeted Thursday. Boeing is also in the race to end NASA's eight-year drought of launching U.S. astronauts on U.S. rockets from U.S. soil. The space agency is turning to private taxi rides to reduce its pricey reliance on Russian rockets to get astronauts to and from the space station. NASA is providing $8 billion for SpaceX and Boeing to build and operate these new systems. SpaceX has made 16 space station deliveries over the past seven years. 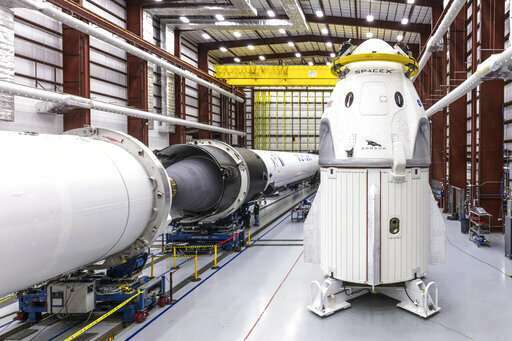 The private company overhauled the cargo Dragon capsule to make it safe—and comfortable—for passengers. It's slightly bigger—27 feet (8 meters) tall—and also launches atop a SpaceX Falcon 9 rocket. But now there are four seats, three windows, computer touch screens and life-support systems. Instead of solar wings, solar cells are on the spacecraft itself. And eight engines are built into the capsule walls for use in an emergency; these abort engines could shoot the capsule off a malfunctioning rocket anytime during the launch. You can't go into space looking dowdy. 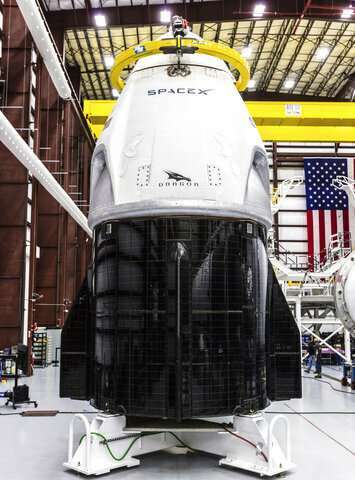 SpaceX chief executive Elon Musk wants Dragon riders looking sharp and 21st century, just like their new, white, sleek spaceship. The streamlined spacesuits are also white with black trim, with matching helmets and gloves. No bulky orange flight suits left over from NASA's space shuttle program. Boeing is going with royal blue spacesuits for its Starliner capsule crews. A life-size test dummy—wearing SpaceX's slick new spacesuit—is strapped into one of the capsule's seats. The mannequin is rigged with sensors to see how it holds up. It's similar to Starman, which blasted off last year in the driver's seat of Musk's red Tesla convertible, on a test launch of the company's bigger Falcon Heavy rocket. The capsule can accommodate up to seven astronauts. For this test, it's carrying 450 pounds (200 kilograms) of supplies and gear. Kennedy Space Center's historic Launch Complex 39A, used a half-century ago for Apollo moon shots and later space shuttle flights, has been remodeled and gussied up by tenant SpaceX. Most notable is the long, enclosed, gleaming white walkway at the top. The old bridge for rocket-boarding astronauts was open to the elements. Astronauts like the new, air-conditioned design. "They're very happy that it's covered, and we're trying to keep the mosquitoes out. Those Florida mosquitoes, they can get in anywhere," said NASA's commercial crew program manager, Kathy Lueders. This mission is a night owl's dream, with most of the big events happening in the wee hours. Saturday's liftoff is scheduled for 2:49 a.m. to sync up with a space station arrival the next day. Unlike cargo Dragon, plucked from orbit by the station's robot arm and guided to its berth, crew Dragon will dock on its own early Sunday morning. The three space station astronauts will enter the Dragon, unload the fresh supplies on board and then fill it with science samples and old equipment. The capsule will undock March 8 and, shortly after sunrise, parachute into the Atlantic, a couple hundred miles off the Florida coast. Just because SpaceX is first off the pad doesn't mean it will launch astronauts before Boeing. SpaceX is shooting for a July crew launch, but that could slip depending on the results of the upcoming demo and a launch abort test this spring. Several items—parachutes and thrusters, among others—still need work and possibly redesign before certified for human use. Boeing is targeting an April test flight of its Starliner capsule without crew, and a launch with three astronauts no earlier than August. Whichever company delivers astronauts first wins a small U.S. flag left at the station by the last shuttle crew in 2011. NASA's Doug Hurley and Boeing's Christopher Ferguson—who both flew that final shuttle mission—will test drive the new commercial capsules. Hurley will ride the Dragon and Ferguson the Starliner.